I’m not a hunter, but I did play one in Texas for a weekend back in December! 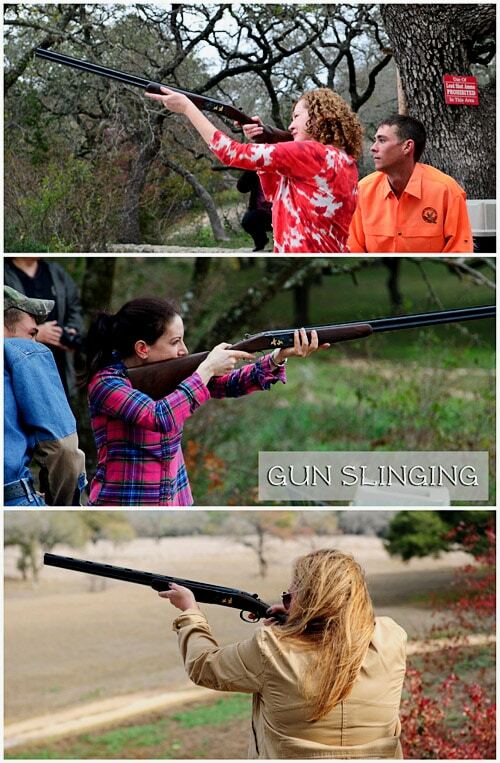 Maybe you saw my tweets and Instagram pics while I was swinging a Silver Pigeon V 28GA Beretta at Joshua Creek Ranch in in Boerne, Texas with 13 other food bloggers! How did this all come about, you wonder? Not your typical “girls weekend” right? Although I do HIGHLY recommend it!! It was a lot of fun stepping outside of our usual realm and learning something new all while bonding! You see, our friend Georgia, has led this really exciting life! 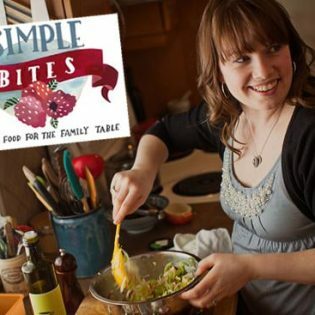 She was a classically trained chef in New York City when she decided to leave the city and learn about where our food really comes from. Georgia traveled with veteran hunters who showed her the ropes and taught her to hunt things like quail, venison, squirrel, turkey, pheasant and elk! 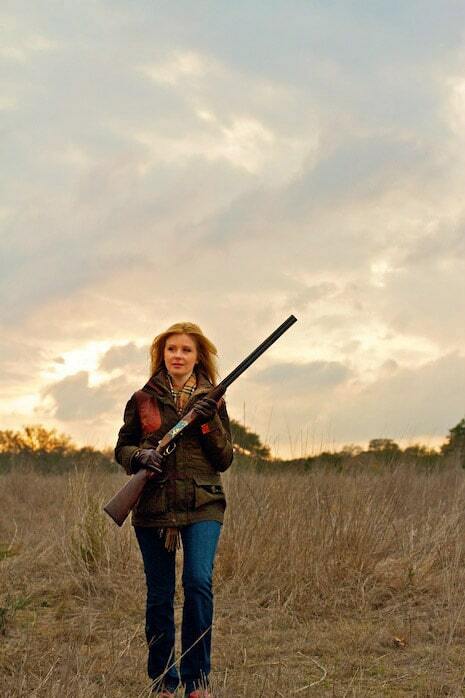 She embarked on this journey to find her main course, but along the way she learned surprising lessons about food and life and she put it all in a book titled: Girl Hunter Revolutionizing the Way We Eat, One Hunt at a Time. Georgia had the grand idea that it might be fun to let some of her friends step into her world, even if it was just for a few days. We climbed out of cars and planes into another dimension. One filled with guns, taxidermy, fishing poles and bunk beads. although where else could you wear a sequined camo dress? HA! 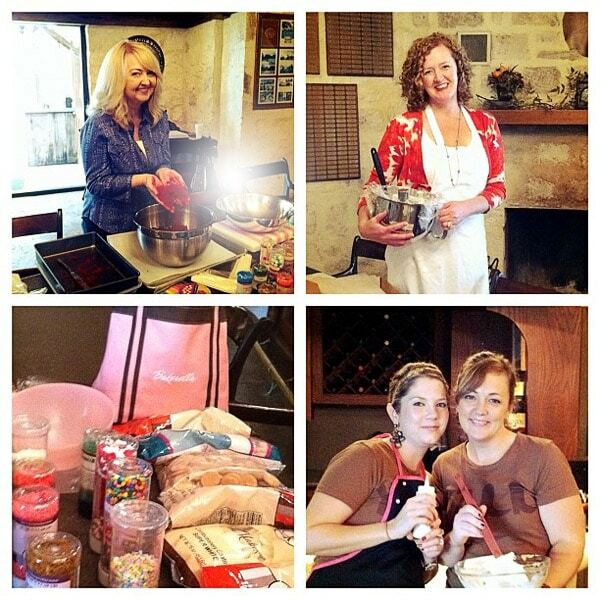 We did spend a little girly time, leaning how to decorate cookies from Bridget, Shelley and Kristan and a few lessons on cake pops from Angie! 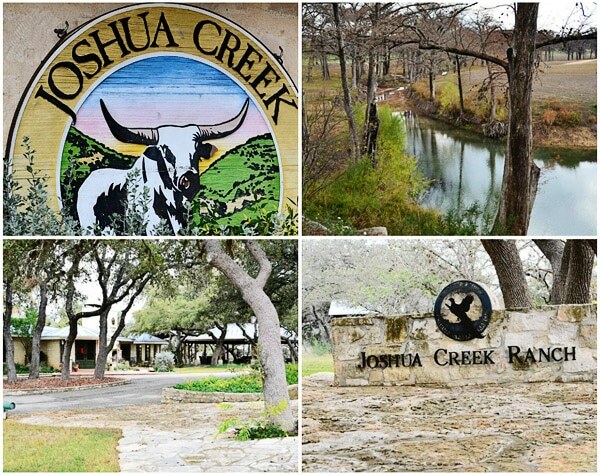 While the staff at Joshua Creek filled our bellies with amazing food from the ranch! We ate like hunters; quail, pheasant and venison! I loved all of our girl bonding over our new experiences. Sitting around the fire sipping wine, listening to Georgia’s stories about an outing that turned illegal and dangerous, making loon calls and eating s’mores. I admire Georgia for her passion and courage! Learning about the art of hunting, sipping brandy with the men and gaining their respect and cooking it all up in one inspiring book! 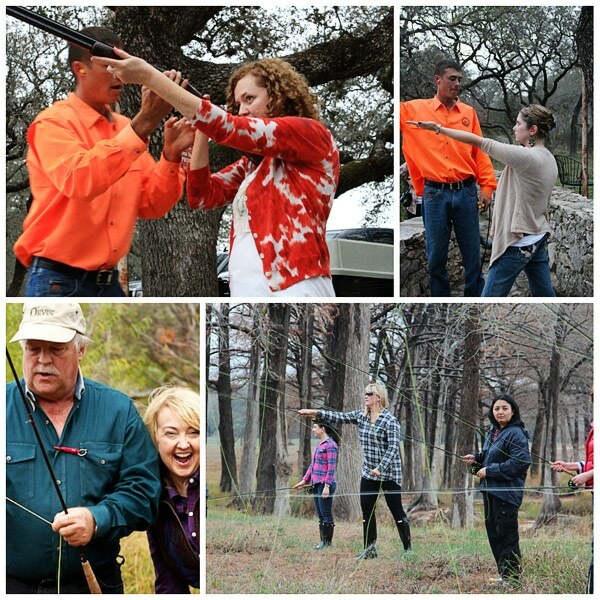 Thanks to Joshua Creek Ranch for hosting all of us Girl Hunters, and to Georgia Pellegrini for bringing us all together for one modern day pioneer weekend we’ll never forget! You can read some of the other great recaps from our weekend. You can watch me shooting clays with Georgia here. 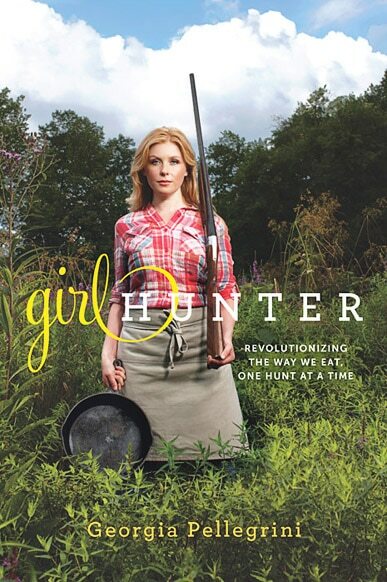 You don’t have to be a hunter to enjoy Georgia’s book, Girl Hunter Revolutionizing the Way We Eat, One Hunt at a Time. Georgia uses style and wit to introduce us to hunting and the art of cooking what you eat. Throughout the book you will meet several characters, learn how she gets along in a sport dominated by men, and find out how to take food from field and stream to plate with mouth-watering recipes for a variety of wildgame. 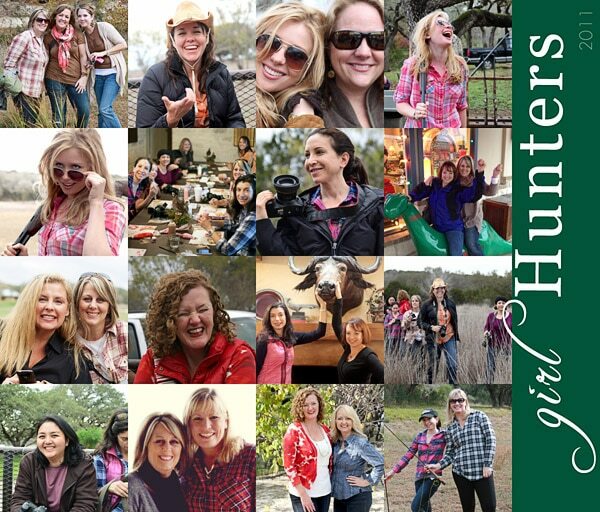 Girl Hunter is full of enthusiastic stories that any new or experienced hunter, chef or foodie can appreciate. You may even find yourself itching to grab a shotgun and skillet! Win It: Georgia and Da Capo Lifelong Books is providing 1 lucky TidyMom reader with a Girl Hunter book! Official Rules: No purchase necessary. Open to residents of US and Canada . Must be over 18. Giveaway will end on January 24, 2012 at 5:00 pm CST. One winner with a valid entry will be selected at random using random.org. Winner will be notified by email and will have 48 hours to claim their prize or another winner will be selected. TidyMom, Georgia Pellegrini and Da Capo are not responsible for lost or undelivered emails. Disclaimer: This giveaway is sponsored by Da Capo Lifelong Books. I was sent an advanced copy of Girl Hunter to read. I was not compensated in any way for this review or giveaway. I am an avid huntress. The most memorable hunt I have had up to this date was this last years gun deer hunt. My dad was sick with liver cirrhosis and I was preparing myself for the worse and made a point to get in the stand with him again. He was able to sit with me for 2 1/2 hours opening day and that was it. I will never forget it because he passed away two weeks later. I’m glad I took the time to sit with him and didn’t go away to deer camp. Don’t take life for granted and truly think about what are the important things in life. Wow, I enjoyed reading about this and looks like it was a ton of fun! I use to hunt but have not in years due to back issues. I have so many hunters in my family and I would LOVE to be able to prepare different dishes for them with the wild game. We use to have wild game suppers once a year. Maybe I can get that restarted and share these recipes! I am on your Facebook and joined The Girl Hunters Facebook! I grew up in South Africa where eating meat has a ritual significance in both traditional and modern South African culture. South Africans are so carnivorous that inviting South Africans to dinner and serving a vegetarian meal may be interpreted as an insult even by sophisticated urban people. I remember one night there was a large community braai to which our family was invited. There were large rotating spits of every legal animal to eat under the sun. We ate zebra, snake, monkey, ostrich, water buffalo, crocodile, wildebeest, springbok, gemsbok, kudu, hartebeest, and who knows what else. It was truly a culturally eye opening experience, certainly to be cherished in my memory for a lifetime! We moved to the US 13 years ago, and I married a Texan! 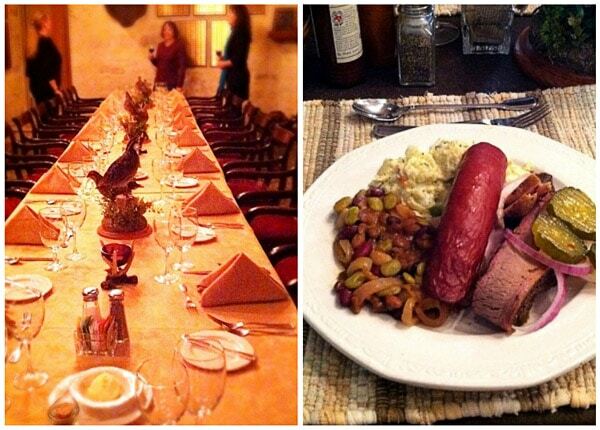 Turns out, meat is a pretty big deal to the Texans too! I LIKE you and the Girl Hunter on Facebook! My husband is a deer hunter. So, we eat a lot of deer meat: roasts, sausage, ground, and tenderloin. I like Tidy Mom and Girl Hunter on Facebook! My husband and his male relatives are the hunters in the family, but since I love the outdoors too, I’m starting to learn as well. I’m only using a rifle so far (and shooting at targets), but my very first shot was a bullseye! With that confidence booster I’ve been fitting shooting in whenever we visit the UP and head out into the woods. The spoils of small upland game and deer is always welcomed, and I’ve enjoyed roasting quail and making venison chili! What a fun weekend you must have had. Since I married my husband 17 years ago, I’ve been a hunter. Never thougth I would but I love it. It’s fun. We use the gun and the bow. I’m not entering the giveaway Cheryl. I enjoyed followed the tweets during your girl hunter weekend and your post about it today is just wonderful. It must have been quite a unique experience for you and many of the other ladies. Georgia certainly was a fabulous hostess! Hunting has been a big yearly event in my family for generations. My husband and son bring home the venison and I fry it up in the pan! We have deer heads, bobcats, and other wild things decorating our home! Love your site Cheryl!! I like cozy mysteries. I have a friend I’d love to share this book with. Your pics of the weekend are wonderful, Cheryl! When I was a little girl I would beg my daddy to take me hunting with him but he always told me I was too little. I never got to go. But I do remember being pretty young, probably around 7 yrs old, that skinned my 1st squirrel! (with a little help from my dad) Then my mom made a delicious stew with dumplings. It was one of my favorite meals growing up. What an adventure! I’ve been reading about this Girl Hunter Weekend from everyone’s blogs and find it fascinating. I’m not a hunter, but I think it sounds like such a cool experience! I love it! Amazing pictures and such a cool girls weekend! Looks like a FABULOUS weekend!!! I grew up eating venison and we’ve had ventured into elk now. I still have plenty in my freezer. Elk are way bigger! I love buffalo and would like to learn how to cook it regularly. Thanks! Fan of both on Facebook, thanks! My brother in law is a huge hunter and he shot a deer one year and brought it to our house. 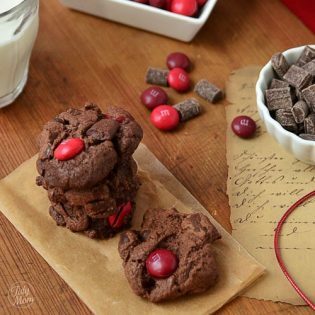 He just cooked it in a frying pan on the stove and surprisingly…I actually enjoyed it! It’s not something I would eat everyday, but I thought it was definitely tasty! My brother-in-law is an avid hunter and keeps our freezer stocked with venison sausage which my kids love. Also growing up overseas we developed a fondness for pheasant. I love this post about your Girl Hunter Weekend. Looks like y’all had a blast. I grew up in Texas, but I live in Alabama now. I’m still a Texas girl at heart, so this makes me miss home. I have never been hunting and I have never eaten wild game, but I’d like to try one day. I like books like Anne of Green Gables and the Mitford series by Jan Karon. I like Girl Hunter and TidyMom on Facebook. I have never eaten wild game, but my husband spent summers in Minnesota with his dad and they used to hunt all the time. I’ve had wild bird before but never any actual red meat. I’d like to try some though! I love reading historical fiction! I have never shot a gun, or eaten any wild game for that matter. However, my blog partner and I are considering doing a month of target shooting. I immediately remembered seeing your post and how intrigued I was to take a trip like this. You know, to stretch my boundaries. Oh, and since you asked, I like post-apocolyptic literature best of all. Maybe I should learn a little survival skills! I’m not a hunter, but I’m a DAMN good shot! I started shooting when I became a marksman first class when I was 8. I haven’t shot in years though. When I was 21, about 20 years ago (you do the math) I moved from NH to OR to “hunt” mushrooms for the Summer. I drove with 3 friends across the country stopping at homes of friends along the way. We stopped at the homestead of a friend of a friend of a friend and they opened their home to us for a couple of days. Even though none of us knew them directly, the woman of the house whipped up some fresh venison stroganoff, whipped potatoes, green beans and bisquits, all on the antique pot-bellied stove while we freshened up. The deer was killed by their youngest daughter and the veggies were all freshly harvested. Although I must say, I am not a big fan of venison, that dinner was one I will never forget. It reminded me of a time long gone by, though not in my time, but a time that must have been. Where life was simple, you lived off the land and you were able to open your home to stranger longing for a home cooked meal and a place to lay their head. Looks like you guys had alot of fun and I just loved the camp sequin dress. I’m going to have to get me one of those. Hunting has always been apart of my life. My family are hunters and my husband is very into hunting. I’ve gone out with him to hunt deer and turkeys. It’s usually the only way to spend time with him during hunting season. We all think that venison is pretty tasty too. I liked Girl Hunter and TidyMom on Facebook. I tweeted the giveaway, here is my page https://twitter.com/#!/TrishaDlubac. 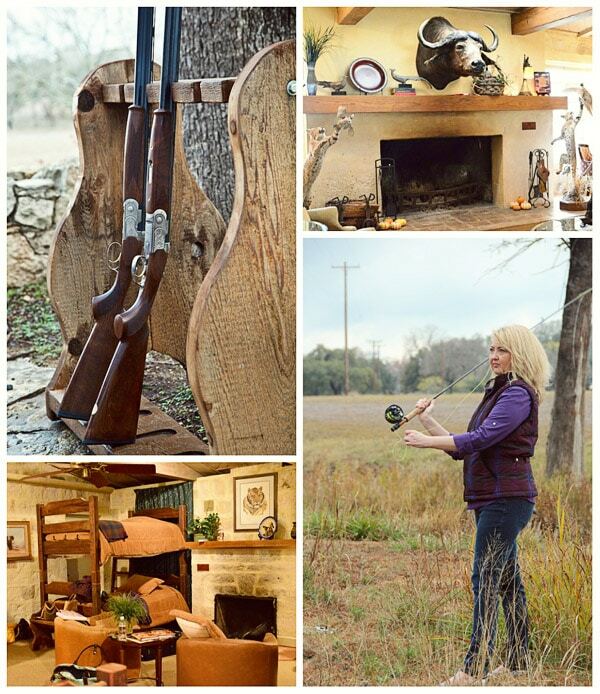 I am a huntress and am passionate about bringing game from the field to the table and to use in our decor. I have been hunting, gathering, cooking, eating and decorating with game for several decades now and may not qualify as a ‘girl hunter’ anymore, so let’s just call me a ‘lady hunter’. My husband and I believe in proper field care and process all our own game, especially venison – that way we know where it came from, how it is taken care of and that it is OUR game. We raised our children loving the hunt and enjoying the food. I make a wonderful venison chili adapted from my great grandfathers 1934 Drug Store recipe. And a fabulous Duck Pate that I decorate at Christmas with lime slices and dried cranberries. We eat game at least once a week and agree that – “Game is one of the last pure products in the world” by John Bain, Baine of Tarves, Scotland.